Have you been watching what’s being submitted for the Into the Forest exhibit later this year? 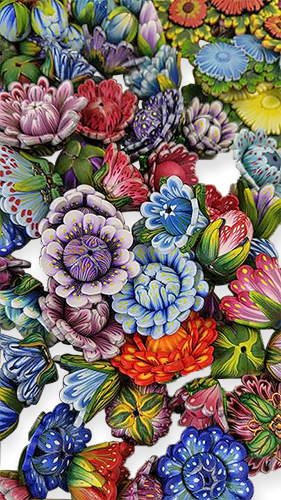 Each leaf, bug and blossom is more intriguing than the last and it’s hard to wrap your head around how Emily Squires Levine, Laura Tabakman and Julie Eakes will combine all the colorful bits they’ve collected for this international collaborative project. This week’s submission from Eriko Page may make you wistful for spring. Her tight round polymer buds are ready to burst into bloom. But wait, a second batch of Eriko’s flowers have already opened! See more of her hyper-real caned flowers on her sales site and FB. A preview of Into the Forest will be on view at this summer’s Synergy4 with the whole shebang on view beginning in November, 2017 in Pittsburgh, PA. There’s still time to join and add your work to the project. Pieces must be postmarked April 4, 2017. Read the guidelines on the FB page where nearly 700 polymer artists hang out, watching every forest fantasy that arrives from around the world. 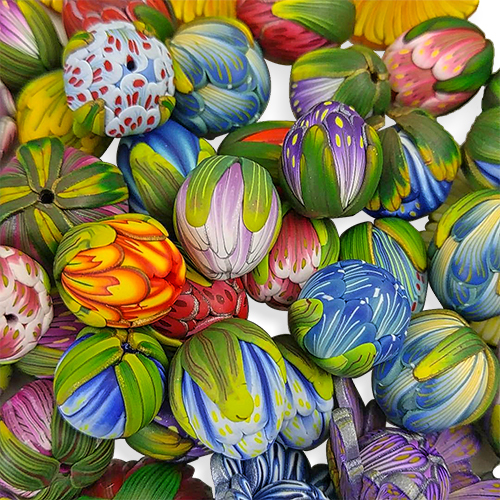 Portland polymer artist Meredith Dittmar has appeared on PCD many times, initially for her small sculptures, now grown into the show, Between Our Eyes, at Mirus Gallery in San Francisco from January 20 to March 3. The gallery describes Meredith’s work as human-animal-plant-energy relief-like amalgams that contain threads of common elements and colors to express deep levels of union across themes of biology, technology, and consciousness. The characters are frequently involved in quiet expressive moments, or lounge facing an audience, sharing their inner space. Dittmar believes it is this space we recognize in ourselves, and through convening in that space, the interconnectedness of all things is revealed. 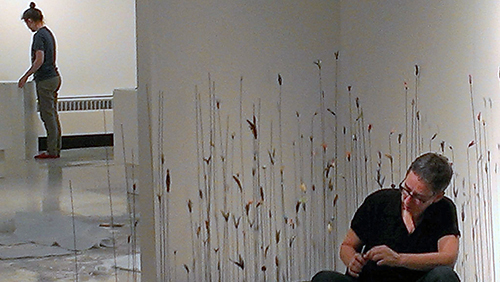 The gallery’s exhibits are edgy and modern and Meredith’s paper/polymer works are dynamic. If you’re not quite sure about the fantasy/technology/biology scenes that you’re looking at on Meredith’s Instagram, Facebook and Flickr, relax and enjoy the mix of paper and polymer, shapes and color on these large works. Let them hit you between the eyes. Today’s the last day to visit Georg Dinkel’s polymer reliquaries and shrines to technology in the Palace of Culture Anwanden. Georg mixes technology, architecture and religion into a delicious ironic stew. His digital devotional pieces ask what we really worship and why. Here’s his latest. Georg’s carefully crafted, elaborate sculptures are positioned against cracked plaster walls next to a curving staircase in a beautifully aging empty building. The old and new, the serious and the sassy play off each other in this festival of light. Georg shares his splendid photographs of the event, saving us the airfare. I’m snatching his photos from Facebook for those who’d rather examine them on PCD. Enjoy your free trip to Germany. Here’s the pdf of the program for those who know German. 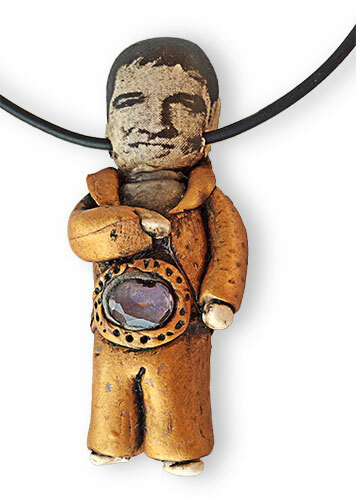 He shares videos of works in process and other sculptures on his site, YouTube and Facebook. 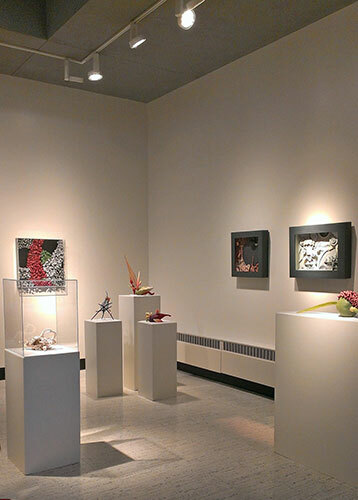 Peek at the polymer exhibit that began this week at Carthage College in Kenosha, WI. The opening reception for Re-Visioning: New Works in Polymer at the H.F. Johnson Gallery of Art will be held next Thursday, September 18. Gallery staff have posted snapshots of the works on Facebook as they arrived to get us excited. Laura Tabakman’s On the Trail is a delicate installation of a field of blossoms that emerge from the floor and climb one wall. Here you see Cynthia Toops’ So Much Yarn, So Little Time which includes tiny knitting needles that pierce one of the balls of imitative yarn wound in Cynthia’s fastidious micro style. At one time or another all knitters and artists have shared the sentiment of the piece. 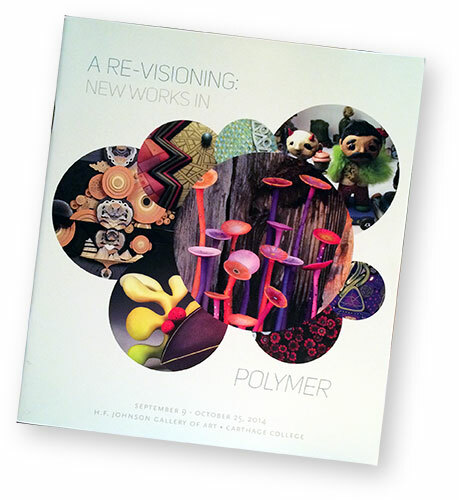 The event is being held in conjunction with an October polymer symposium, labs, and (in)Organic exhibit at the nearby Racine Art Museum. The first college level polymer studio class was launched last year at Carthage College. Professor Diane Levesque taught the class and curates this exhibit.